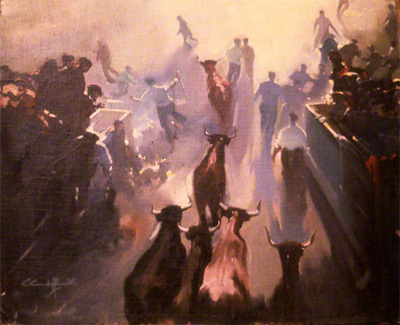 Oil painting by Claude Buckle showing the event in Pamplona 'running of the bulls'. 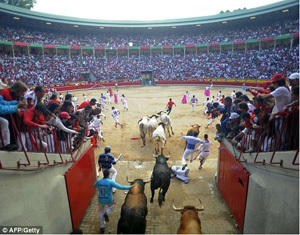 The picture shows the entrance of the bull ring at the end of run with bulls and people mingled together. Pamplona is the historical capital city of Navarre, in Spain, and of the former Kingdom of Navarre. The city is famous worldwide for the San Fermín festival, from July 6 to 14, in which the running of the bulls is one of the main attractions. This festival was brought to literary renown with the 1926 publication of Ernest Hemingway's novel, The Sun Also Rises. Created in 1956. The event in Pamplona 'running of the bulls'. The photo shows the entrance of the bull ring at the end of the run.